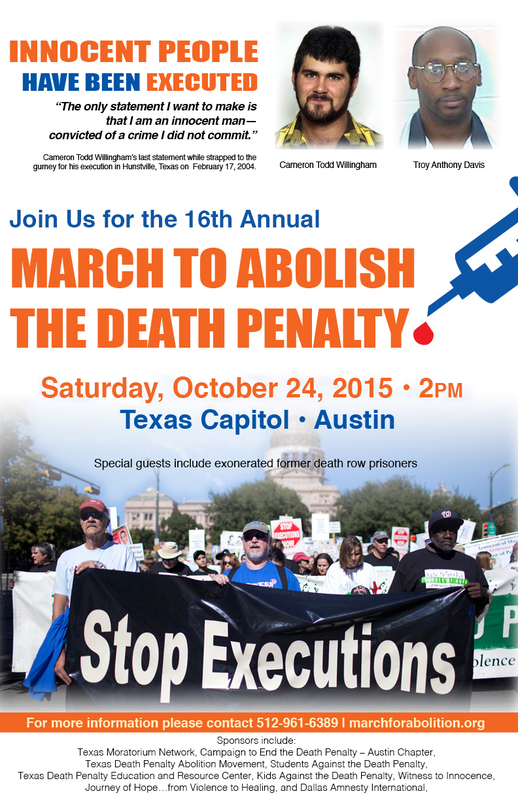 Join us on at the Texas Capitol for the 16th Annual March to Abolish the Death Penalty. Alfred Dewayne Brown is coming to the 16th Annual March to Abolish the Death Penalty. Dewayne was released on June 8, 2015 after more than 10 years on Texas Death Row for a crime he did not commit. Come to the march and welcome him back to freedom with a warm collective embrace. Donate to the march. We need funds to host death row exonerees, plus other organizing expenses. Special guests include members of Journey of Hope … from Violence to Healing: Bill Pelke (grandson of murder victim), Randy Gardner (brother Ronnie Lee Gardner was executed by the state of Utah on June 18, 2010), Edward Mpagi (over 18 years on death row). More special guests include exonerated death row survivors and members of Witness to Innocence: Ron Keine, Shujaa Graham, Sabrina Butler, and Gary Drinkard.